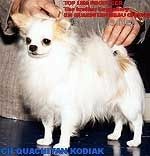 OUACHITAH KODIAK - World Pedigree DataBase Chihuahua, Chihuahua Pedigree DataBase. Titles: BISS CH.USA, CAN, ROM.BISS CH.USA, CAN, ROM Multiple All-Breed BIS Winner in Canada Group winner in the U.S. and #2 All-time leading sire in breed history. The number 2 producing male Chihuahua in the history of USA. BIS winner.